"Helpless. Powerless. Because that's the only way they can keep you here." Characters bring with them a variety of powers, some of which are used for good and some of which are used for bad. 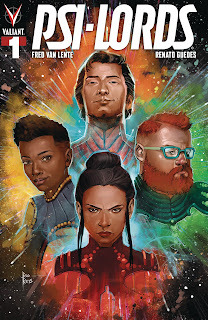 In Psi-Lords #1 from Valiant Comics, it's up to the reader to decide. The issue is written by Fred Van Lente, illustrated by Renato Guedes and lettered by Dave Sharpe. Who are the cosmic beings known only as the Psi-Lords? And how will they change the course of the Universe in this brand-new ongoing series? Four astronauts awake in an otherworldly prison with no memory of how they got there! What is their connection to the Psi-Lords? And how will they escape? 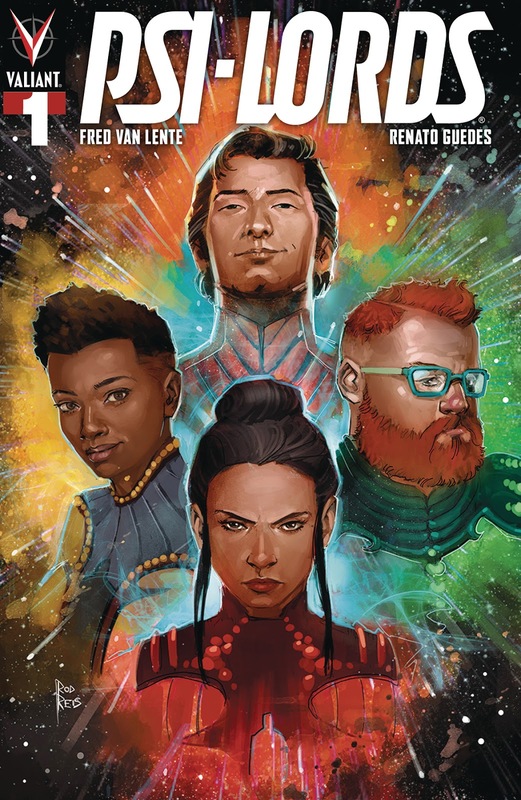 Van Lente is no stranger to the Valiant Universe and in Psi-Lords #1 he's digging in again, primarily by introducing all the members of the team. Most of the issue plays out in this way, showcasing each individual character and stressing their innate abilities. This corner of the universe has relied on characters with plenty of ability--something Van Lente doesn't skimp on in terms of weaving into the plot. Van Lente's dialogue is very adept at demonstrating this point, relying on characters making observations about the others in a way that informs the reader about them. The main characters have an abundance of questions they need answered and Van Lente leans on that uncertainty as well to direct the narrative. Guedes' artwork is a very abstract take on the characters, providing an interesting look at the characters. The way Guedes uses the linework is a little fuzzy, but it works to add sense of mental projection to the look of the book. The Psi-Lords rely on their mental ability to convey their strength and because Guedes illustrated the characters in this way it ties into their abilities. Much of the issue is rife with insets and overlays as Guedes floats panels around to again reinforce the idea that the characters are of another world. The colors are also extremely helpful in helping the reader to discern who's who amongst the Psi-Lords, especially evidenced by a double-page spread where the characters are highlighted in single-colors. Psi-Lords #1 is a pretty heady first issue. The Psi-Lords are extremely powerful and capable individuals who are looking to strike out on their own. Van Lente's script works really well and is very methodical in its approach. The artwork by Guedes is very foreign in many regards and it works well for the context of the book. Psi-Lords #1 has a lot of balls in the air and it'll be interesting to see how the series plays out. Psi-Lords #1 is available June 19.